You don’t have to be a bookworm to appreciate Paris’ new literary hotel, Le Pavillon des Lettres (www.pavillondeslettres.com), but it certainly helps. Drawing on the City of Light’s rich literary history, the tiny 8th arrondissement boutique hotel contains just 26 rooms – one for every letter of the alphabet. Each lettered room corresponds to an author of the same initial (think “H" for Hugo, “M” for Musset), and the décor creates a sort of homage to the writer: French volumes of the artist’s work rest on the nightstands, and quotes from the books are etched onto the glass bathroom doors and painted on the wall behind the bed in oversized scrawl. Although such a rigid theme could turn out gimmicky, the hotel executes it well. Didier Benderli – the creative mastermind behind trendy sister hotel Pavillon de la Reine in the Marais – patterned the property’s sophisticated palette of beiges, coppers, butters, and mauves, all a refreshing departure from some of Paris’ more gilded properties. Downstairs, the front lobby’s brushed-velvet chairs, long cream banquettes, and crackling fireplace encourage lingering, as does a bookshelf lined with gold-embossed hardcover classics and a guest honesty bar. 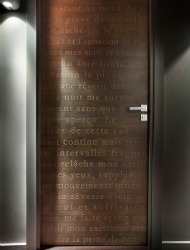 To keep from neglecting modern scribes, Le Pavillon des Lettres also outfits each room with a dedicated iPad. The gadget comes fully loaded with books and music, including works from the room’s signature author. Wi-Fi, happily, is free – though note that only one device per room may connect at a time.